Figure 1. This 5.19 ct CVD synthetic diamond (10.04 × 9.44 × 6.18 mm, with J-equivalent color and VS2-equivalent clarity) is the largest GIA has identified to date. Photo by Johnny Leung and Tony Leung. The 5.19 ct cushion modified brilliant measuring 10.04 × 9.44 × 6.18 mm (figure 1) was submitted to GIA’s Hong Kong laboratory for grading service. The stone was not disclosed as a synthetic diamond. Using the lab’s standard screening and testing processes, it was identified as CVD synthetic. Following examination, a GIA Identification Report was issued and the stone was inscribed on the girdle with the report number and the words “Laboratory Grown,” following GIA’s protocols for undisclosed synthetics. This is the largest CVD synthetic diamond GIA has examined to date, and the largest reported in the jewelry industry. It had J-equivalent color grade and VS2-equivalent clarity, comparable to a high-quality natural counterpart. Natural-looking internal inclusions such as needles and clouds were the major features (figure 2). Strong graining and a fracture in the table were also clearly observed under the microscope. It is worth noting that black inclusions, often contained in synthetic diamond, were not found in this CVD specimen, which could have been mistakenly identified as natural based on microscopic examination alone. 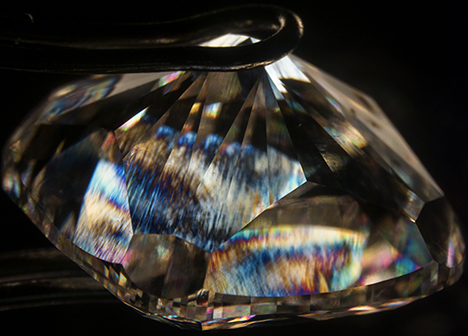 This case therefore highlights the importance of using advanced spectroscopic instruments as well as conventional gemological techniques to ensure an accurate identification. Figure 2. Needles and pinpoints were the major internal features. Black inclusions, a common feature of CVD synthetic diamond, were not observed. Photo by Billie “Pui Lai” Law. Viewing the sample under a binocular microscope with cross-polarized light revealed irregular birefringence patterns with high-order interference colors, a common feature of CVD synthetic diamond (figure 3). Fluorescence images under the short-wave UV radiation of the DiamondView showed strong red fluorescence with irregularly distributed areas of violet-blue (figure 4). The images also revealed a layered growth structure, indicating a start-stop cycling growth process typical of CVD synthesis. Up to six growth layers basically parallel to the table were identified from the fluorescence features. These multiple growth segments make it possible to grow such a thick sample. Figure 3. Microscopic examination between crossed polarizers revealed high-order interference colors, attributed to strong lattice dislocation. Photo by Billie “Pui Lai” Law. Figure 4. Fluorescence imaging from the DiamondView showed strong red fluorescence with bundles of violet-blue. Up to six growth layers basically parallel to the table were revealed. Photo by Billie “Pui Lai” Law. Infrared absorption spectroscopy identified the sample as type IIa. Except for a very weak absorption at 1332 cm–1, no other absorption features (such as hydrogen-related defects) were detected. 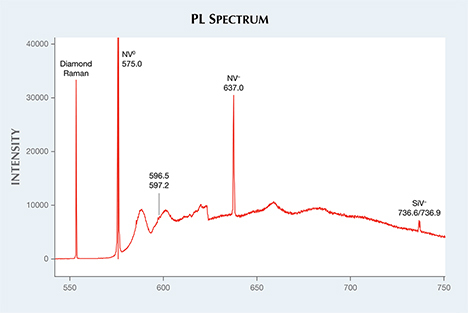 Photoluminescence (PL) spectra were collected at liquid nitrogen temperature with various excitation wavelengths. The SiV– doublet at 736.6 and 736.9 nm, a common feature of both CVD and HPHT synthetics and only rarely seen in natural diamond, was observed using 457, 514, and 633 nm laser excitation, suggesting the sample’s synthetic origin. Spectra acquired with 514 nm laser excitation also showed emissions from NV centers at 575.0 nm (NV0) and 637.0 nm (NV–), with the NV0 center dominating in intensity (figure 5). The occurrence of a weak emission pair at 596.5 and 597.2 nm, in combination with the absence of H3 emission, unequivocally identified this as an as-grown CVD synthetic diamond. No post-growth annealing had been applied to improve its color appearance. Figure 5. The photoluminescence spectrum acquired with 514 nm laser excitation revealed strong emissions from NV centers in addition to emissions from SiV–. 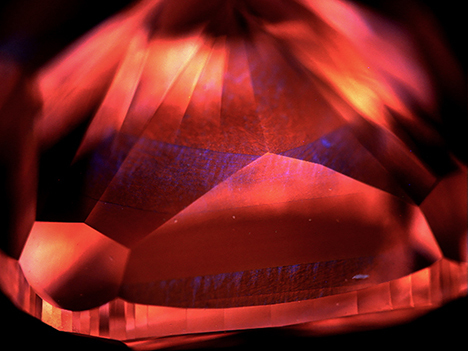 Emissions at 596/597 nm indicated that this synthetic diamond was not annealed after growth. CVD synthetics are available from several sources. 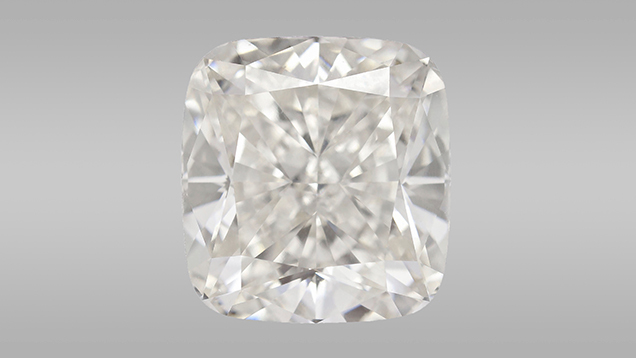 The gemological and spectroscopic features of this 5.19 ct sample are very similar to those GIA has examined from Washington Diamonds (now known as WD Lab Grown Diamonds). 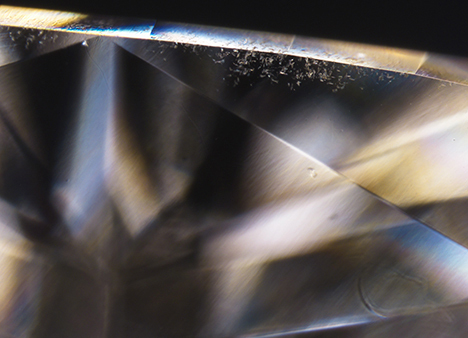 As diamond growth techniques continue to advance, we expect to see more high-quality samples, both in size and clarity. Billie “Pui Lai” Law is a diamond grader at GIA’s Hong Kong laboratory. Wuyi Wang is GIA’s director of research and development. Explores statistical data and defining characteristics of gem-quality CVD synthetic diamonds examined by GIA since 2003. Two near-colorless rounds, weighing 3.23 and 2.51 ct, were the largest CVD-grown synthetic diamonds GIA has examined. A survey of recent advances in CVD synthetic diamond quality.